Chloe Carter is ready for her fifteen minutes of vicarious fame. Her boyfriend, Josh Driscoll, is competing with two other chefs to win Chefly Yours, a cable reality series. The show takes place at an upscale market, where a random shopper is selected to be the lucky recipient of a home-cooked gourmet meal; the winning chef is then chosen by the viewers. But Josh’s television career might be over before it starts when a shopper’s wife, Francie, dies after dining on his signature lamb chops and pesto gnocchi. It wasn’t Josh’s cooking that killed Francie. It was a lethal dose of poison. In between planning her best friend’s wedding and helping at her parents’ landscaping business, Chloe sifts through suspects ranging from Josh’s rival contestants to pranksters who may have taken a joke too far. Was Francie the intended victim? Or was she simply in the wrong place at the wrong time? The discovery of her true identity and a secret Josh has been keeping conspire to disrupt the wedding as Chloe faces off against a killer ready to turn the impending nuptials into a fatal feeding frenzy. 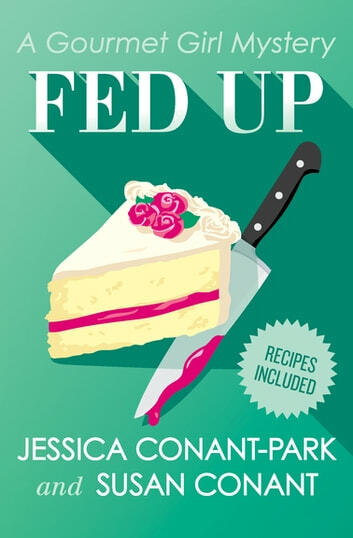 Fed Up is the 4th book in the Gourmet Girl Mysteries, but you may enjoy reading the series in any order.